The Washington lake is a beautiful five acres lake situated in the green park area. The artificial lake and aquatic park is composed of many parts. One semisubmerged restaurant with 900 sqm structure distribuited on 3 levels that gives place for 300 people and a big terrace for outdoor meals. The main attraction is the big hall 8 metres under the water level that allows marvellous 360 degree sights of underwater life. One docking area allows four Trilobis 65 (semisubmerged dwelling unit) to stop and take supply of all the needs. Docking submarine for the little two places submarines used for an underwater close observation. Also there are exposition and commercial areas. 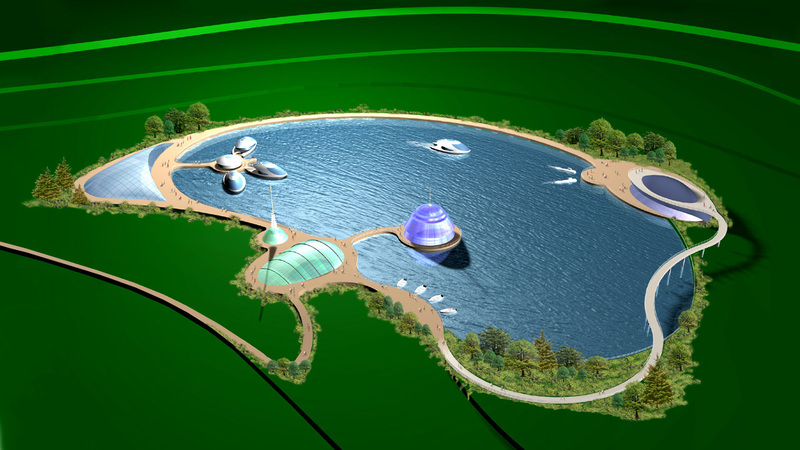 Built in a new and unique structure, it provides different sensory experieces with the amazing sights of the lake’s flora and fauna.